Like many others, I'm a time-poor kind of person, but.... 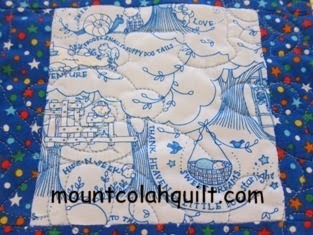 I received a request to make a cot size quilt for a baby boy at the end of November 2013. 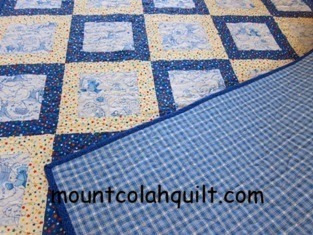 It has to be a blue and white modern kind of quilt. The request was a special one as the quilt will be a gift for the first grandchild of one of my previous (and wonderful) bosses. So, I made myself available to make the quilt. 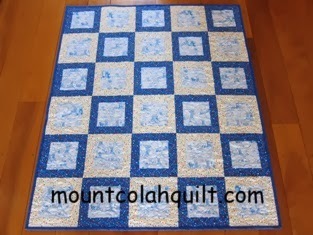 I like the simple and effective look of square in square quilt, so decided on the pattern. It wasn't hard to put together the fabrics as there are so many lovely matching designs available on the market. I quilted the quilt using the pattern named 'zoobrdr' by TJ Speiser. 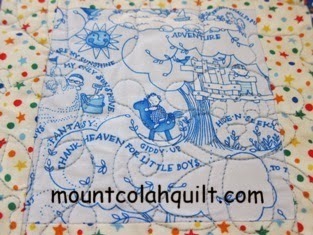 The quilt will be on its way to the US in the very near future.